Chicha is a traditional Latin American fermented (0r non-fermented) drink made with maize , and it is also the name of a hip new eatery in town. I’ve been hearing whispers of “black cod at Chicha”, and all of a sudden everyone is talking about cheviches like they’re hotter than Abercrombie models. So I was very, very excited about trying out this new restaurant that took over the space previously known as Chez Patrick on Peel Street. It was packed when we arrived, and our table wasn’t ready yet, so we sat outside on barstools on their sidewalk area, palm fronds swaying in the T8 breeze. I ordered a Pisco Punch while we waited, and if you like fruity cocktails then this lovely concoction of pisco, pineapple juice and lime, then this is for you! – Peruvian cuisine has a lot of international influences due to immigration, with hints of Spanish, Italian, Chinese and Japanese. 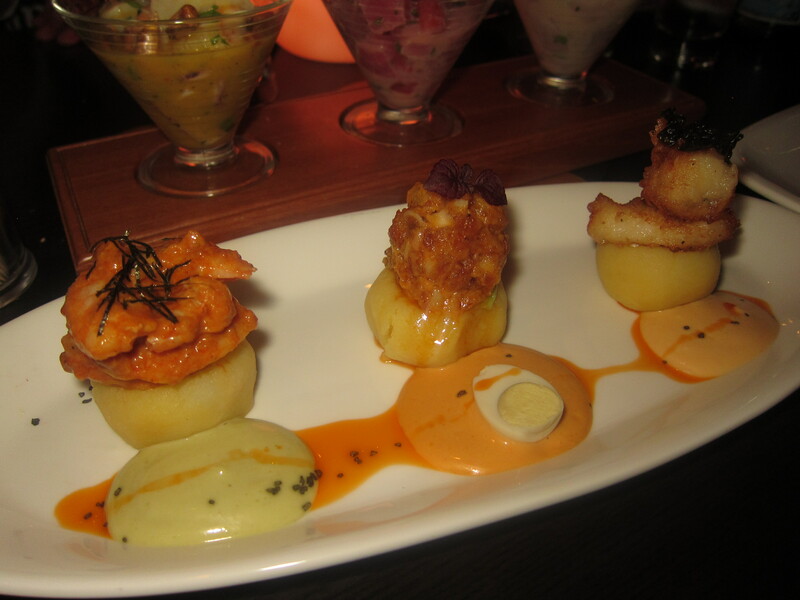 – Three traditional backbone elements of of Peruvian cuisine are corn, sweet potato and ajies (chilis). Upon entering the restaurant, the first thing that you will notice is that it is bustling – it’s busy, really busy. And everyone seems to be thoroughly enjoying themselves, which is a good sign indeed. Swiftly after this, you will realise that it’s very noisy – in this small dining establishment, the sound bounces off the walls and you’ll have to adjust the volume of your voice by a few decibels. Now, to the food. It has been a while since I’ve been to a restaurant where I bit into something so surprisingly tasty that I had to stop chewing to register what my taste buds were telling me. That’s what all of us at the table experienced when they served the pan con chicharrones ($50/piece). We went for the pork and chicken choices, while the pork belly was yummy, the chicken was a-mazing! 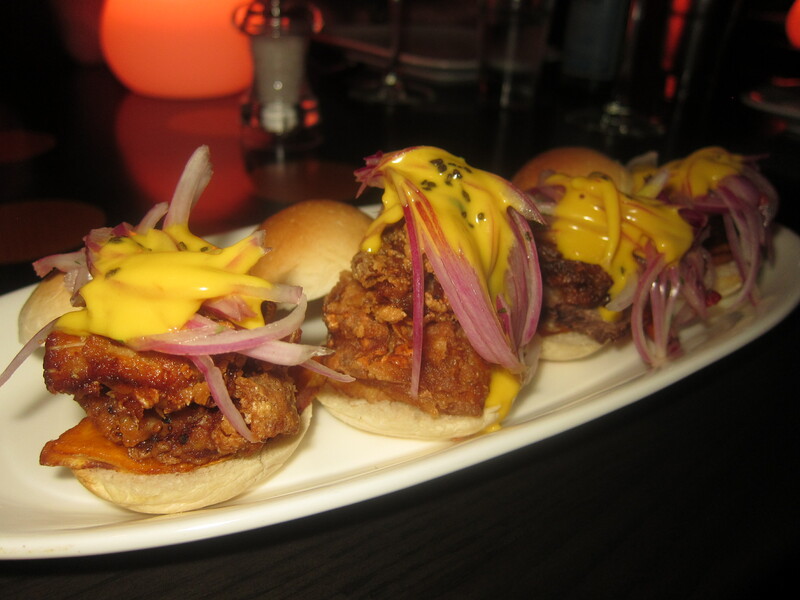 Crispy fried chicken with sweet potato, a generous mound of red onions served with a creamy aji amarillo (Peruvian yellow chili pepper) sauce, this Peruvian mini-burger is seriously good stuff. Next came the causa (any 3 for $185)– another traditional dish consisting of cold, seasoned mashed potatoes together with a topping. We tried one of each of the prawn, squid and black cod. Each came with it’s own colourful dipping sauce, and beautifully presented on a long plate. The one most worth mentioning was the squid, the crispiness of the fried squid, the creaminess of the potato, together with the sauce created the perfect mouthful. The black cod was also great, with the prawn coming up a slow 3rd place. Next came the cheviches, which I must say were not as good as I was expecting them to be. 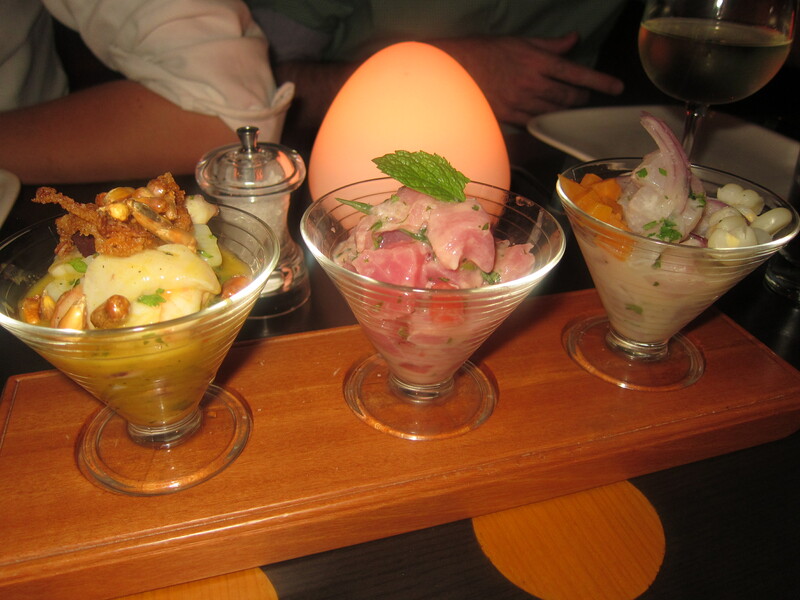 We ordered the trio of chevices ($295 for the trio, or $138-$158 each), Again they were well presented, but we found the leche de tigre (or tigers milk), the Peruvian name for the citrus marinade, too overpowering so that the taste of the fish was non-existent. We did, however, discover two new interesting Peruvian ingredients: Cancha, toasted corn kernel, which look like pine nuts but super crunchy and a pleasant surprise when you bite down on them; and Choclo, a variety of corn that sports exceptionally huge kernels! The Corvina – sea bass, choclo, leche de tigre. The Tuna, with watermelon, tarragon and leche de tigre. 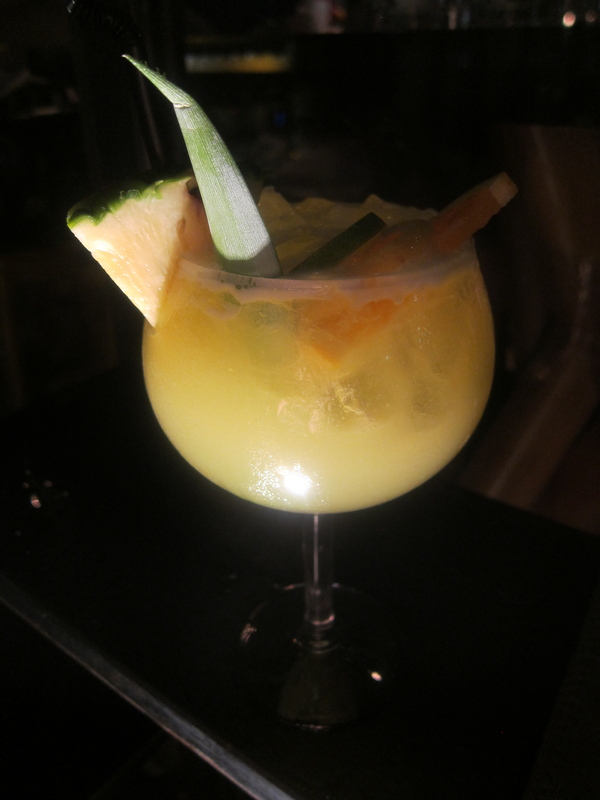 The Mixto – mixed seafood, cancha, passionfruit, leche de tigre. Of course we had to go for the Taco Peru choices (4 for $180, or $50 each), we chose two pork and two fish, leaving the chicken and squid to try another day. The main ingredients are served ‘chicharrone’ style – seasoned and deep fried. 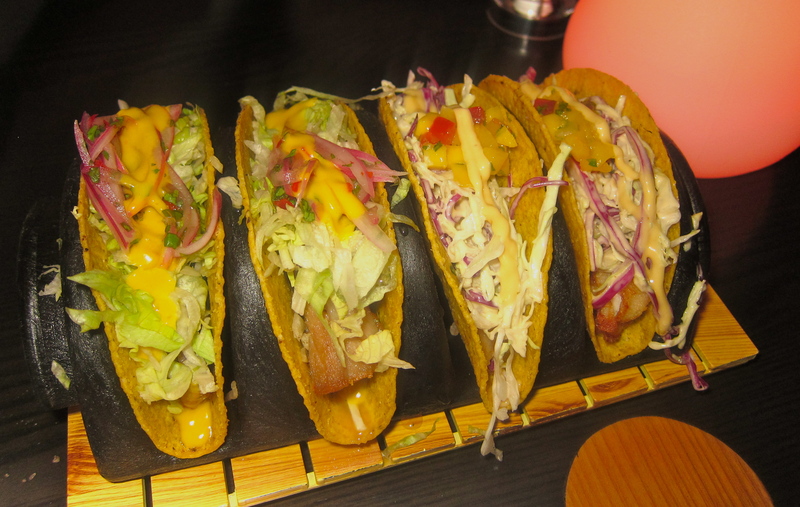 Served in a hard taco shell, they were easier to share than expected. The pork taco was garnished with salsa, lettuce, red onions and that beautiful aji amarillo cream, whilst the fish taco is topped with a really nice coleslaw and mango salsa – definitely one of the winners of the evening. Finally, we ordered 2 skewers of the famed black cod anticuchos – a popular grilled skewer often sold by street carts and street food stalls in Peru. You might notice that I do not have a photo of said skewers, and that is because there was not enough time to take a picture – they were gone in seconds. The third highlight of the meal, served with a ponzu miso sauce and a special aioli (there’s that Japanese influence! ), literally melted in the mouth. The flavours were exquisite, subtle and yet wow at the same time. There are several choices ($40-70 per skewer), including beef heart, chicken, octopus, tomato and camote. 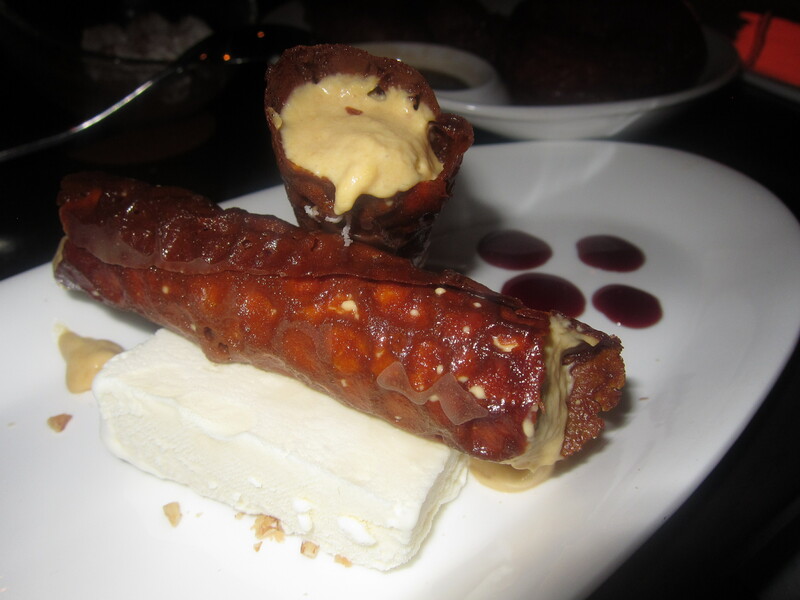 Everything that we order to this point satiated us fully, and yet we thought we would try a couple of the desserts. Priced similarly as one taco, or one anticucho, we thought they would be ‘small bites’ as well. 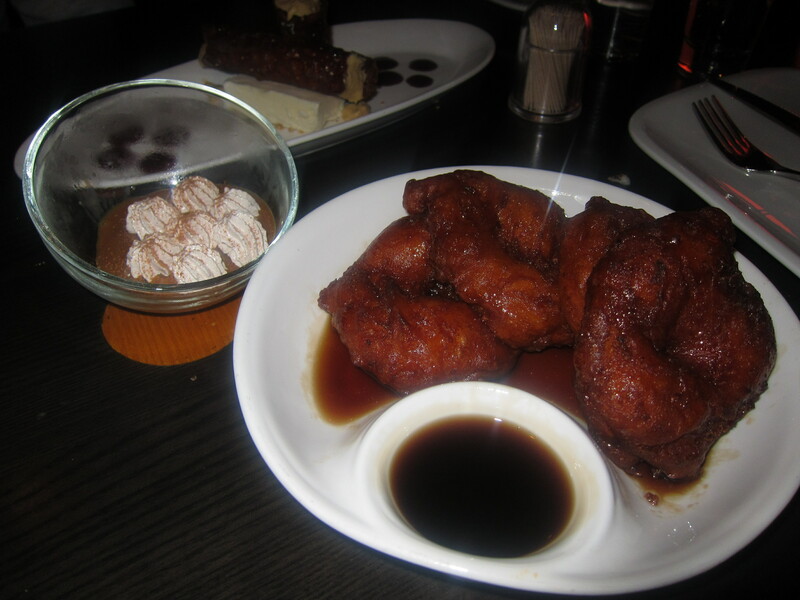 We ordered three of the four choices, Suspiro de Limena (a rich caramel dolce de leche-type dessert), Canutos Crocantes (sugar snap filled with custard – sort of like a cannoli, served with coconut ice cream), and Picarones (deep fried sweet potato doughnuts orange spiced syrup). Oh boy, were they anything but small! I usually avoid (specifically) Mexican food, because I associate it with cheap, heavy refried beans that turn to concrete in the stomach, bucket-loads of cheese and a general heart attack on a plate. What I love about Chicha is it turned all I know about South American cuisine on its head. It was light, flavourful and fun! Dessert unfortunately left us all feeling a bit ill, and perhaps it was our fault for ordering three of them. The donuts were GREAT, but so filling, and one serving has four pieces!! The Suspiro de Limena was pure sugar and cream and really, one spoonful was enough for me. The Canutos was quite nice, and the coconut ice cream refreshing. It was just too much. You gotta try this place – even if you don’t make it for dinner, just stop by after work for an after work drink, sit on the bar stools outside, order a Pisco Punch and order a few black cod anticuchos – it will be a very happy Happy Hour. 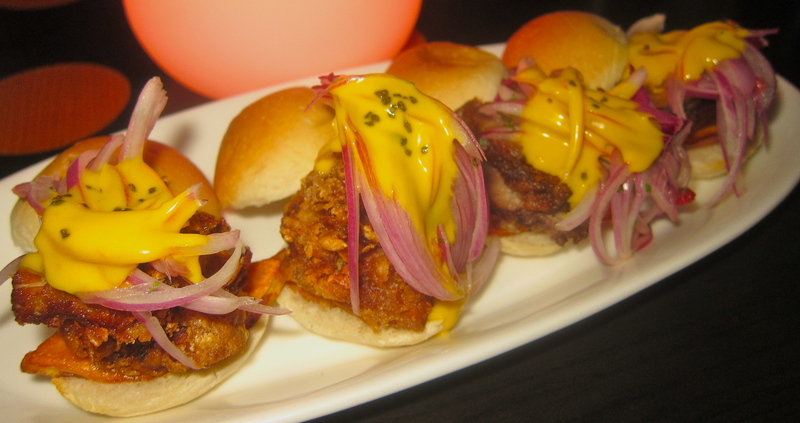 Mmmmmm Mini Burgers and Fish Tacos! Yum Yum Yum! Nice! I can’t say I’ve tried any good spanish / mexican restaurant in HK, so let this be the first! !